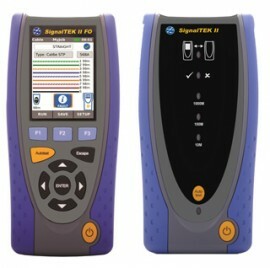 Meet our Handheld qualifier designed to confirm correct installation of copper and fiber cabling capable of supporting voice, video, data and CCTV applications over 10/100 Megabit or Gigabit Ethernet. 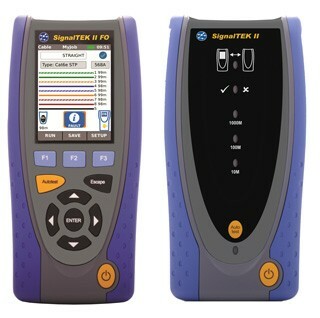 SignalTEK® II is essential for all installers of data cabling whether working in residential premises, small to medium-sized offices, or industrial Ethernet environments. 1 x Near-End unit (copper and fiber), 1 x Remote unit (copper and fiber), 2 x Power module (rechargeable), 2 x Mains PSU/charger, 2 x 30cm RJ45 cable, 1 x Quick reference guide (English), 1 x User manual CD, 1 x Carrying case. Fiber optic SFP modules not included.